This is our version of a “Super Shampoo” – designed to reset the hair and remove yucky build-up caused by minerals, silicone, chlorine, shea butter, and any other product build-up. Use this product before applying nourishing and styling products, or before you color or highlight to allow the color to adhere better and last longer. Suggested use for this product is once every 4-6 weeks. A little goes a long way! Directions for use: Massage a generous portion onto wet hair and evenly distribute from roots to ends. Leave on approximately 3-5 minutes and rinse thoroughly. 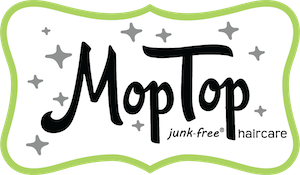 Follow up with your favorite MopTop conditioner to restore moisture. NOTE: Extreme build-up may require multiple applications.